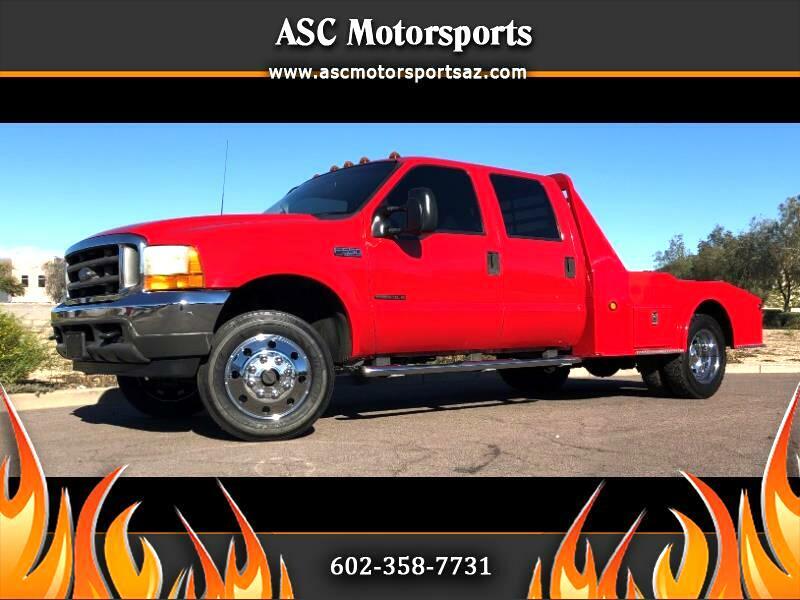 2001 Ford F-550 Crew Cab 4X4 7.3L Diesel 152K Miles w hauler bed!!! Stunning truck with fire engine red exterior, gray cloth interior looks like new, 2 owner southern California truck with absolutely no rust or accidents!!!!! 4 wheel drive, 152K miles, ice cold A/C, power windows, power locks, power steering, 40/20/40 split bench seat with power driver seat, cruise control, tilt wheel, AM/FM stereo, 6 disc CD player, running boards, tow package, tinted windows, sliding rear window, power mirrors, 225/70R19.5" polished aluminum wheels, with excellent tread tires. 94 gallon aluminum aux fuel tank with electric pump plumbed in to factory fuel tank on truck, gooseneck hitch and 2" receiver in the rear of the western hauler bed, brand new spare tire and rim. Very rare, very meticulously cared for. Will not last long. Make it yours today! Priced at only $22,888+ tax, title and doc fees!! !